I thank Mark Isaiah David for reviewing Foy at 2nd Opinion. Back in 2002, a Baptist preacher from Texas launched a blog about faith and life and humorously titled it Real Live Preacher. RLP became an internet sensation, regularly receiving hundreds of thousands of hits, continuously ranking in the top ten most-popular blogs hosted by Salon.com, and even birthing three books. Due to his honest, unique, and characteristically “unstuck-up” Christian ways, Gordon Atkinson’s blog became an online haven not just for people of the faith but also for those that have none. Atkinson defended homosexuals, wrote about what’s in a preacher’s pants, bravely shared how a bong-smoking man dying of AIDS became a deacon of their church, and lovingly compared the Bible’s inscrutabilities to a seductive woman who will share her mysteries only to those who pursue her with abandon. He could be writing about math, the best taco in Texas, or the animated movieThe Iron Giant, but deep within the words, Atkinson is really writing about the God who—he confesses—may or may not really be there. But that was in the early 2000s. A decade and a half later, Atkinson left his church, took down his famous blog, and began the scary journey of discovering who he was apart from being a minister. In no small part, these upheavals in Atkinson’s life became instrumental in crafting the story of Foy—a man escaping his history to find life outside of everything he has known. Some might mistake Foy as Atkinson’s thinly veiled autobiography. It’s not. As good writers are inclined to do, Atkinson uses what he knows to craft an authentic and intimate narrative of a man who has lost everything and must now relearn how to build his life anew. The language is characteristically Atkinson’s. He makes no attempt to hide the messy realities of faith; as such, he is able to transform the insignificant, the unlikely, and the problematic into something genuinely beautiful. Foy is an intimate peek into a man’s passage to the other side of faith. It’s a journey of unlearning and rediscovery, full of what seems like trivialities that become the cornerstone of one’s psyche. It’s achingly beautiful, preciously woeful, and always honest. Foy: On The Road To Lost is only volume one of a tale that will span a couple of years (volume two will come out late 2017). Instead of structured chapters that tell a story, the book has numerous short stories that show glimpses of Foy’s life. And like life itself, the readers will know the full story only when the final page is printed. It is a testament to Atkinson’s skill as a writer that even though I have been reading about Foy for years, I still don’t know how his story will end. What I do know is that Atkinson continues to exhibit the same mastery and skill that helped make his blog an internet hit. He could write about mundane things such as biking or whiskey or jobs, but the truth is, he would still be writing about a man looking for his way. He would still be writing upward. 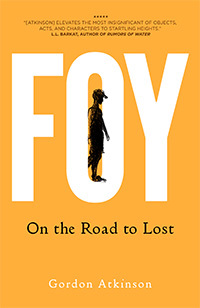 Foy: On The Road To Lost is coming out on paperback and e-book format this March and is available through materialmedia.com and Amazon.com.